We cannot possibly have a faith worth anything if we don’t put our beliefs in action. “So also faith by itself, if it does not have works, is dead.” (James 2:17) So what does “living out your faith” look like? Here are just 6 of many ways that we can show our identity in Christ as we serve our fellow man. I know that God has placed someone on your heart already that needs prayer. This is a motivation brought on by the Holy Spirit. Take the time to pray for your pastors, that they may stay true to the Word as they preach and lead you in worship. Pray for that friend of yours that you have wanted to talk to about Christ. Pray that God will soften their hearts in advance so your words will be received with sincerity. There is always someone to pray for. The power of prayer is absolutely unbelievable sometimes. I have a good friend that just adopted a boy from the Ukraine with his wife. Countless times he called me with financial concerns with funding the adoption; we are talking about thousands of dollars here. Every single time we prayed together or separately, God was there and He always provided my friend with the money through someone from church or a neighbor or even an anonymous person. Through prayer and faith, God brought that wonderful boy back to the USA to a caring, loving family that will bring him up with the truth of God’s Word. Do you know what the Holy Spirit is? He is our “helper” as described in John 14:26. When we pray to God and really don’t know what to say, the “Spirit, Himself, intercedes for us with groanings too deep for words.” (Rom:26b) This same Spirit that takes control in prayer also spurs us on to do works for Christ. The Holy Spirit speaks to us mainly through scripture. The scripture is truth and when that truth makes an impression on you to act, the Holy Spirit has actually motivated you to act. Also, the Holy Spirit sometimes will make a huge impression on you to do something. If you are unsure if He has spoken or not, consider what you are thinking about. The Spirit will never ask you to do anything that is against the Word. So, follow when the Spirit speaks! 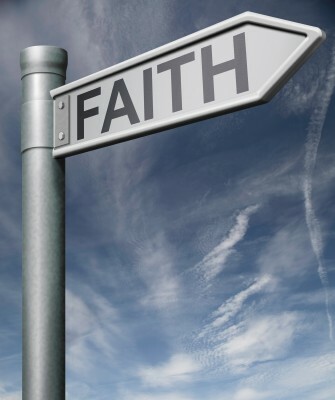 We cannot possibly have a faith worth anything if we don’t put our beliefs in action. There is always one role that you can play in your church, whether it is serving communion/offering, greeting people at the doors, or taking a head count to see how many attended the services. You have been given skills and talents by God, so use them. If you are a people person, being a greeter would be awesome for you. If you are great with electronics and computers, being on the audio/video tech team would be a perfect fit for you. Romans 12:6a sums it up when it says, “Having gifts that differ according to the grace given to us, let us use them.” God has blessed you with a skill set and it is important to use it for the good of the church. Whatever is said in scripture should be acted upon in obedience. The Ten Commandments really are a great place to start if you have never looked intently at the Word. These are found in Exodus 20:3-17. IV. Remember the Sabbath day, to keep it holy. “Every tithe of the land, whether of the seed of the land or of the fruit of the trees, is the Lord’s; it is holy to the Lord.” (Lev 27:30) Just as Christ came to obey and fulfill the law, we must also obey. God requires us to give 1/10 of the money we earn (which He has really given us) back to Him. Not only that, but God invites us to test Him in it. “Bring the full tithe into the storehouse, that there may be food in my house. And thereby put me to the test, says the Lord of hosts, if I will not open the windows of heaven for you and pour down for you a blessing until there is no more need.” (Mal 3:10) I can assuredly attest to this. A few years back we didn’t have enough money to buy the kids Christmas gifts. We still tithed, and by the grace of God one of my good Christian brothers gave me a check for a substantial amount of money that covered all of my children’s gifts. I was literally brought to tears when he gave me that check. It is a moment of grace that has touched me to this day. A great mission to support that helps children in need with both their physical and spiritual needs. Consider browsing the list of children and find one to support today. God has called us to live by the Word and obey the Word. If you are following His precepts that are written in His holy Word, you can know for certain that you are living out a genuine faith. Feel free to suggest any more ideas about living out your faith. May God bless you as you become a blessing to others. Great advice here…thank you. I have a friend who also has adopted from Ukraine, I think he has adopted 2 girls and 1 boy…so far. There is such a need there. So much poverty and neglect. I admire those who are able to adopt these kids. They are truly involved in sharing Jesus’ love with the world. Thanks again, Derek. Derek. I so agree with Robert. I believe that this article is about as well stated as any I have ever read about our walk with Christ, and this includes what I have learned in seminary. God is using you powerfully my brother. I see the Holy Spirit in your words and your comments to others and me. I think this article should be a mission statement for not only every believer but for every denomination. Outstanding. I love how you covered the truest elements of our walk…and it is a faith with feet on it. Be blessed Derek as much as you have blessed us at this site, as well as the readers, but no less than me personally in my relationship with you. I thank God for you brother that He allowed us to cross paths for I will never, ever be the same again. Thank you so much Jack. I have looked up to you from the first article that I read by you. You know the Bible so well and you convey its meaning with clarity and grace and I have been immensely blessed by you also brother. I consider it an honor to write for such an amazing website. Every writer here has so much to give and I have learned much from every one. You are such an encourager and I appreciate your friendship. God bless you Jack. My life has forever changed also, for the better. God is so good and I am glad to surround myself with his children that write for WCWTK. Thank you Robert. I really appreciate your kind words. I work with a woman who migrated here from the Ukraine and she has told me just how poverty stricken and neglected the children are. By a certain age, if children are not adopted they are sent to institutions where all they do is lie in beds with no one to pay attention to them. My heart broke when she told me this. The children literally starve for food and love. I am so thankful for those who have the means to adopt and do adopt. They are living the Christian life to the fullest. God bless you Robert. Thank you for the kind words Al! I count it a privilege to honor the Almighty through writing articles. Blessings on you and your family. What a mighty God we serve who just gave us a very powerful messanger like u Derek oh fil the presence of the Lord as i read your article may the name of our Savior be praised AMEN! Thank you Beauty. Our Savior, Jesus Christ, is amazing!! He brings healing, comfort, joy, peace and so much more when we put our faith and trust in Him. He is our brother, friend, and Savior! I can’t wait to be with Him finally in Heaven for all eternity! Blessings on you and your loved ones! Nice article, I liked it and blessed too. Nice man keep it. Stay blessed in The Holy Blood of Jesus Christ with your family. Thank you Kamran. Your words mean a lot! My prayer is that we can all be more like Jesus each day! Blessings on you and your family too. Thank you for a great article. My heart goes out to those kids from the Ukraine. Could you please send the details to me of a reputable adoption agency so that I can investigate this further? Hello Sam. If you are interested in adoption, I highly recommend doing research on your own. One agency I would recommend looking into is Bethany Christian Services. However, please research in detail any agency you find. God bless! Thank you very much for the word, it is going to go a long way in me because i am using it as my next sermon right away. the reason I find it important to mention this is because I witness a pastor telling some new christians who just lost their jobs was only getting unemployment check not enough to cover even their rent was facing eviction and told them no matter what give God the first tenth and these people literally got up and said they could not afford to serve God . that is what made me look deeper into the word . sorry wasnt trying to step on toes .